Wrongheaded Obama's policy.... it will backfire on the US and the free world, not only Israel and region. According to Israeli reports, Obama walked out of his meeting with the prime minister for a private dinner. Mar. 22: Israel Prime Minister Benjamin Netanyahu addresses the American Israel Public Affairs Committee Policy Conference dinner in Washington. For a head of government to visit the White House and not pose for photographers is rare. For a key ally to be left to his own devices while the President withdraws to have dinner in private was, until this week, unheard of. Yet that is how Benjamin Netanyahu was treated by President Obama on Tuesday night, according to Israeli reports on a trip viewed in Jerusalem as a humiliation. After failing to extract a written promise of concessions on settlements, Obama walked out of his meeting with Netanyahu but invited him to stay at the White House, consult with advisers and "let me know if there is anything new", a U.S. congressman, who spoke to the Prime Minister, said. "It was awful," the congressman said. One Israeli newspaper called the meeting "a hazing in stages", poisoned by such mistrust that the Israeli delegation eventually left rather than risk being eavesdropped on a White House telephone line. Another said that the Prime Minister had received "the treatment reserved for the President of Equatorial Guinea". Left to talk among themselves Netanyahu and his aides retreated to the Roosevelt Room. He spent a further half-hour with Obama and extended his stay for a day of emergency talks to try to restart peace negotiations. However, he left last night with no official statement from either side. He returned to Israel yesterday isolated after what Israeli media have called a White House ambush for which he is largely to blame. Sources said that Netanyahu failed to impress Obama with a flow chart purporting to show that he was not responsible for the timing of announcements of new settlement projects in east Jerusalem. Obama was said to be livid when such an announcement derailed the visit to Israel by Joe Biden, the Vice-President, this month and his anger towards Israel does not appear to have cooled. How on earth these people can be "peace partners" with Israel? Rabbi Meir Avshalom Hai - a 45-year old Israeli and father of seven children - was killed in a drive-by shooting last Thursday. The Al-Aqsa Martyrs' Brigades, part of Palestinian Authority Chairman Mahmoud Abbas's Fatah movement, took responsibility for the killing. On Friday night, Israeli forces located and killed three of the terrorists involved in the attack. The fourth surrendered to the PA police. The response of the PA has been unequivocal support and backing for the terrorists. 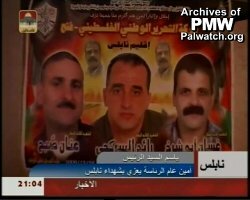 Since Friday, the leadership of the PA, the heads of Fatah, the heads of the Al-Aqsa Martyrs' Brigades and the PA-controlled media have continuously portrayed the killers as Palestinian heroes and Shahids -- holy Martyrs -- while describing Israel's killing of the three terrorists as "murder in cold blood" and "assassination." "Secretary General of the President's Bureau, Tayeb Abd Al-Rahim, conveyed condolences on behalf of President Mahmoud Abbas to the residents of Nablus and to the families of the three Shahids [Martyrs] for the Martyrdom of their sons, who were assassinated by Israeli occupation forces yesterday morning. He conveyed to the fighting families letters of condolences from the President [Abbas] and updated them as to [Abbas's] decision to declare them as Shahids [Martyrs] of the Palestinian revolution..."
Tayeb Abd Al-Rahim: "Without doubt, what the [Israeli] occupation authorities have carried out is a wild and barbaric act and a deliberate, malicious assassination in cold blood." PA Prime Minister Salam Fayyad went even further, personally visiting the families of the terrorists along with other senior PA officials. "Prime Minister visits Nablus and conveys condolences to the families of the Shahids (Martyrs). Prime Minister Dr. Salam Fayyad today visited the city of Nablus in the wake of the Israeli military operation, and presented condolences to the families of the three Martyrs who were murdered by the occupation forces. Dr. Fayyad was accompanied by Internal Affairs Minister Dr. Said Abu Ali, leaders of the security agencies, and Police Director-General Major General Hazem Atallah, and they visited the house of mourning, which was held in the Trade Unions compound in the city... The Prime Minister condemned the Israeli military operation in the city." "Mahmoud Al-Aloul, member of the Fatah Central Committee, said that the occupation murdered these three young men as well as another three in Gaza, in cold blood. He described them as '[military] commanders, brave heroes, and fighters.'" "With honor and admiration to those who are more honored than all of us." "The Palestine Liberation Organization, Fatah, accompanies to their wedding:"
"The Shahid Imad Mughniyeh group [named after Hezbollah terrorist] of the [Fatah's] Al-Aqsa Martyrs' Brigades has denounced the [Israeli] crime of the assassination in Nablus, killing three Fatah activists, including Anan Sobh, who, according to the [Fatah's Al-Aqsa] Brigades, planned the Tulkarem operation which led to the death of the settler in a shooting operation." "A group announcing that it belonged to the Fatah's Al-Aqsa Martyrs' Brigades claimed responsibility for the shooting... 'The Jihad Fighters confirmed that the person who was in the car had taken a direct hit, and praise to Allah - the Jihad Fighters escaped unharmed...' The announcement said that 'this action is part of a series of operations; you can expect more quality operations [terror attacks] from us.'" Headline: "The occupation murders three residents of Nablus in cold blood... the President's [Abbas's] Bureau denounces the Israeli crime..."